Across multiple years and multiple franchises, Sony has uniformly prevented PS4 games from playing nicely online with versions of the same game on other consoles. Now, Bethesda is warning that such cross-platform support is "non-negotiable" for the coming console versions of The Elder Scrolls: Legends collectible card game, potentially barring the title from Sony's system. 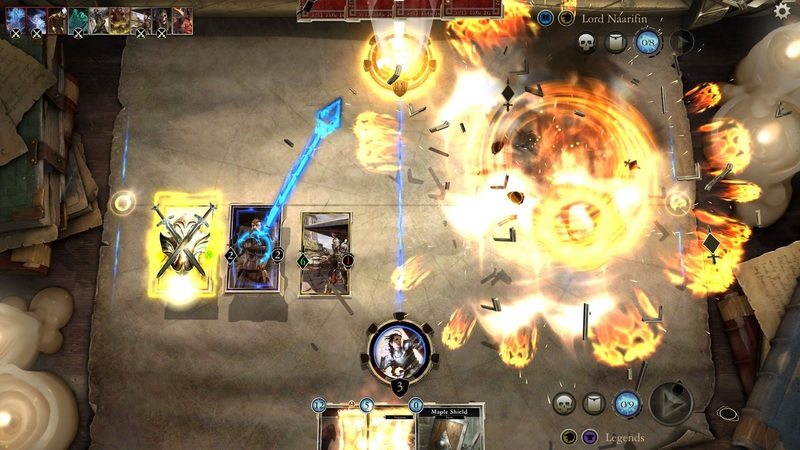 In an interview with Game Informer, Bethesda VP Pete Hines says that any and all versions of The Elder Scrolls: Legends need to allow for full, unrestricted cross-platform play and cross-platform progress. The applies to the current versions—which already work seamlessly across iOS, Android, and PC platforms—as well as previously announced console versions planned for "later this year." "It is our intention in order for the game to come out, it has to [have full cross-platform support] on any system," Hines said. "We cannot have a game that works one way across everywhere else except for on this one thing." "Those [terms] are essentially non-negotiable," Hines continued later in the interview. "We can't be talking about one version of Legends, where you take your progress with you, and another version where you stay within that ecosystem or its walled off from everything else. That is counter to what the game has been about." While Hines didn't name Sony specifically, this cross-platform position would seem to be an obvious sticking point for the previously announced PS4 version of the game. Hines told Game Informer that Bethesda "continue[s] to talk to all our platform partners" about this issue, but Sony has seemed particularly unmovable on the subject thus far. Still, this kind of "non-negotiable" promise (threat?) from a major publisher is just the kind of thing that could potentially get Sony to make some movement. For all the complaining from players, developers, and publishers, you could argue that Sony hasn't felt much direct pain as a result of its anti-cross-console policy so far. Major multiplayer games including Minecraft, Fortnite, and Rocket League continue to be made and sold to the PS4's 82-million-plus potential players, and Sony continues to rake in licensing fees from those sales. As we've discussed previously on Ars, Sony's walled-garden approach arguably makes some sense as a way to exploit the competitive advantage of its larger console player base. Locking out other console networks potentially discourages individual, "locked in" players from moving to competing consoles where they'd be cut off from their friends. The easiest way for that competitive calculus to change is for publishers to start refusing to release their cross-platform online games on the PS4, as Bethesda is doing here. At that point, Sony has to start balancing the potential competitive advantage of player lock-in against the lost licensing fees from the game (or games) that are skipping the PS4. While one Sony executive recently said he was "confident" a cross-platform "solution" was coming in the future, this is the kind of thing that could make it come that much faster. Before you start casting Bethesda as a bold, uncompromising hero in this cross-platform drama, though, it's important to remember that the company has no such non-negotiable position for its other major online console release of the year: Fallout 76. On the contrary, for that game, Bethesda's Todd Howard was quite explicit in telling German site GameStar that the company would love to have cross-platform support but simply dropped it because "Sony is not as helpful as everyone would like." Fallout 76 is still planned for a PS4 release alongside other platforms this November. Potentially losing a spin-off Elder Scrolls card game is one thing. But if Bethesda forced Sony to choose between blocking cross-console play and getting the next major Fallout game on its platform, that could definitely get the executives talking.